There's a reason the world's top shooters choose the Salient name. Salient Arms's collaboration w/ the lightweight gear geniuses at Malterra tactical has produced a series of weapon storage/transportation solutions that embody the Salient ethos of reliability and cutting edge design. 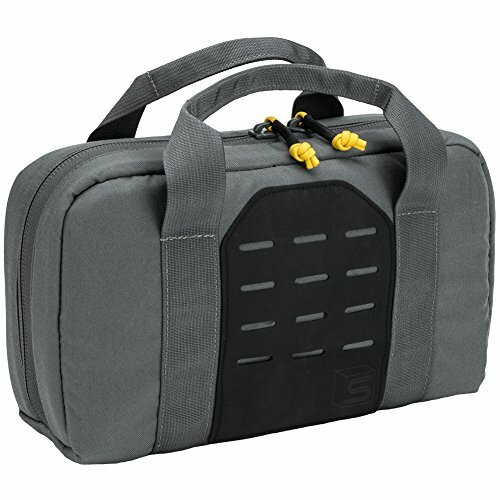 Each bag is made with heavy duty Salient Grey 500D wear & tear resistant ballistic nylon. Micro-cell padding protects your equipment from bumps, drops, & scrapes while staying light & easy to carry. On the exterior, a laser cut Terralon(tm) panel allowing for any PALS or MOLLE compatible pouches or accessories. The interior features hook & loop fleece-like material which not only protects your weapon but allows for IFF or morale patches. Features removable, modular hook & loop based strap retention systems to store any sized & shaped weapons/accessories. Most gun bags will carry your guns. But only the Salient Arms x Malterra gun bags will give you the build quality, attention to detail, & cutting edge ingenuity. In Salient we trust. Dimensions: 13" x 9" x 3"
Manufactured and Assembled in the USA! Free Shipping at checkout! Just make sure you're buying from Evike Inc. If you have any questions about this product by Evike, contact us by completing and submitting the form below. If you are looking for a specif part number, please include it with your message.